Tis the season for apple goodies! I kind of see October as the month for pumpkin and November & December are the months of the apple, although I may sneak another one or two pumpkin goodies onto my blog in the next few weeks. It has been calm here and no snow since last week. As a matter of fact our first flurries of the year were exactly today one year ago, so we started a week ahead this year and we ended up with more than just flurries and it was a few small inches. Thanksgiving is upon us, do you have plans set? Will you be with family or friends? Do you do all the cooking and baking or is it shared? Do you have your menu done? I love to look at other peoples menus to see what other families eat and serve. 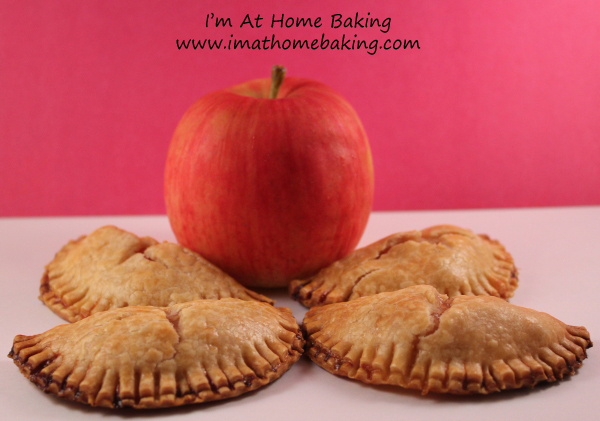 These Apple Hand Pies would be amazing to bring to the table as a dessert on Thanksgiving day. They are easy to make and I like the individual serving as well as just how cute they simply are! It is also so easy to make these your very own by adding spices and other fruit or nuts to the mix. If you do, use a juicy fruit I would only use a little as you want a “thicker” filling for these. If you are pressed for time or don’t like to make your own “crust” you can always use the prepackaged pie dough’s on the market, they work just fine with this recipe. I absolutely love making and eating these, especially on a chilly winter day! To make the pastry, in a bowl, combine the flour and salt. Place the butter in another bowl. Place both bowls in the freezer for 1 hour. Remove the bowls from the freezer and make a well in the center of the flour. Add the butter to the well and, using a pastry blender, cut it in until the mixture resembles coarse meal. Make another well in the center. In a small bowl, whisk together the sour cream, lemon juice and water and add half of this mixture to the well. With your fingertips, mix in the liquid until large lumps form. Remove the large lumps and repeat with the remaining liquid and flour-butter mixture. Pat the lumps into a ball; do not overwork the dough. Cover with plastic wrap and refrigerate for 1 hour. If preparing ahead of time, the dough can be stored at this point for up to one month in the freezer. Divide the refrigerated dough in half. On a lightly floured work surface, roll out one half of the dough to ⅛-inch thickness. Using a 4½-inch-round biscuit cutter, cut seven circles out of the rolled dough. Transfer the circles to a parchment-lined baking sheet, and place in the refrigerator to chill for about 30 minutes. Repeat the rolling, cutting, and chilling process with the remaining half of dough. I used a 4-inch cutter. Mix the diced apple with the sugar, and cook over low heat for 8-10 minutes, until the apples are tender. Set aside. Prior to preparing the pies, drain any accumulated liquid from the apples. Remove the chilled dough from the refrigerator, and let stand at room temperature until just pliable, 2 to 3 minutes. Spoon about 1 to 2 tablespoons filling (use the smaller amount for a 4-inch circle) onto one half of each circle of dough. Quickly brush a little cold water around the circumference of the dough, and fold it in half so the other side comes down over the filling, creating a semicircle. Seal the hand pie, and make a decorative edge by pressing the edges of the dough together with the back of a fork. Repeat process with remaining dough. Place the hand pies back on the parchment-lined baking sheet, and return to the refrigerator to chill for another 30 minutes. Heat oven to 375 degrees. Remove the chilled hand pies from the refrigerator, cut a small slit in each and lightly brush with the egg yolk wash. Sprinkle sanding sugar generously over the pies, and place pies in the oven to bake. Bake until the hand pies are golden brown and just slightly cracked, anywhere from 20 to 40 minutes, depending on how thick you rolled the dough. Remove the pies from the oven, and let stand to cool slightly before serving.